At Home with Chas: Unexpected Blessings! Yesterday was a full-to-overflowing day of good ole fashioned work. Beginning early in the day and going on all-day-long from one task to another. I love getting a lot accomplished though. It makes me happy to be productive. Work is good. I think we need to remember that and teach that more often. During the work of the day, we found a treasure. The elderberry bushes that my boys had planted for me this past spring not only have grown A LOT, but they also flowered and put on berries! I'm so thankful we had a small harvest. 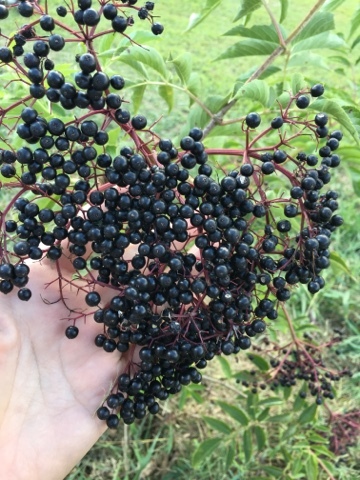 Elderberries in my own yard. Woot-woot! Today will be full of more good work. These beauties below have been boiled and have been setting overnight pulling the juices and today will be pressed to make juice and jam. 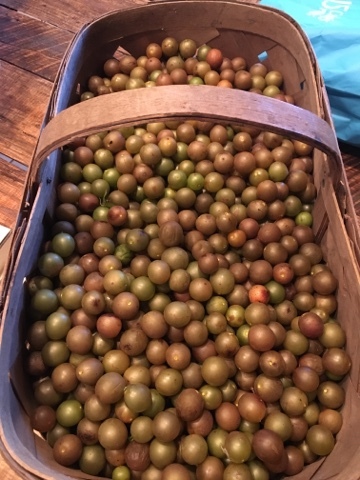 Scuppernongs. Yum! 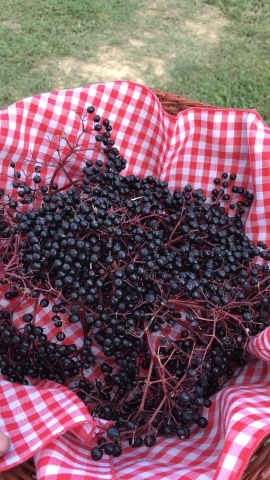 With two large pots of juice waiting, my unexpected elderberries, and a basket-full of peppers from the last of the summer garden (most likely) today will be busy. Tie in school and normal home-upkeep and mothering and my cup runneth over again and again. Unexpected blessings abound!